Consistent STAT turnaround time. Large load-up capacity. Carryover ≤0.1 ppm – sample to sample and tube to tube. The ARCHITECT c8000 clinical chemistry analyzer provides all these benefits to help you achieve excellent first-time results and fever reruns. With the ARCHITECT c8000, you can have speed, certainty, and confidence in your clinical results. 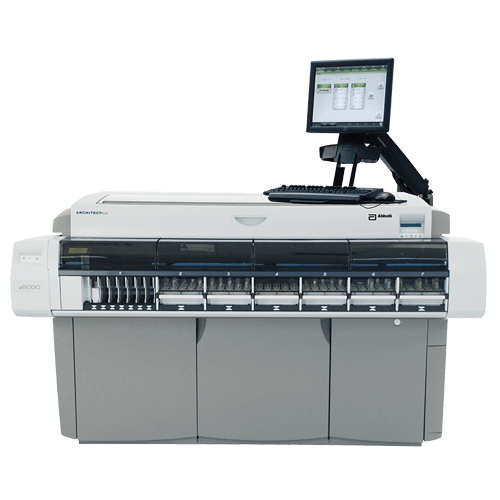 The ARCHITECT c8000 offers a maximum throughput of up to 1,200 tests per hour. Featuring a load-up capacity of 215 samples with 35 priority positions, the ARCHITECT c8000 has up to 121 refrigerated reagent positions plus Integrated Chip Technology (Na+, K+ and Cl-).